Remember when you'd have to scrub your home's siding with a brush and a bucket of water? Those days are long gone, and luckily for all of us, pressure washers are here to stay. It may seem like a no-brainer to use a pressure washer to clean your vinyl siding, but by following the steps below properly, you'll be less exhausted, stay safe, and finish in half the time. Don't be intimidated by the power of a pressure washer. Pressure washers are easy to operate and are perfectly safe for cleaning your siding, contrary to what you may have heard before. The trick is not to use lower water pressure so the water doesn't get behind your siding or damage the surface. *Pro-Tip: The secret is to start on a low-pressure setting and slightly adjust the pressure as needed. From there, always use appropriate soap or detergent, and avoid using corrosive cleaning solutions that contain undiluted bleach or untraditional cleaners like furniture-polishes or degreasers—they'll all damage your siding! For one-story homes, almost any pressure washer will do just fine at low pressure. For two-story homes, homeowners should consider a gas-powered pressure washer (more powerful) to reach high, hard-to-reach spots. Or, you could consider using an extension wand or a telescoping wand tool with a support belt to extend your reach from the ground and spray close to the surface of the stains. Soap and water is always a better cleaning combination than water alone. Better still is pressure washer detergent. Most pressure washers come with an injector to mix cleaning solutions right into the jet stream. Only use solvents that say "approved for pressure washer use" on the label. Unapproved solvents may not be environmentally friendly and could eat away at critical pressure washer components. Apply the soap mixture under low pressure with smooth, overlapping strokes. To prevent streaking, start from the bottom and work your way up. Pressure washing is a lot like painting. If you get "hose happy" and randomly spray everything, you're bound to miss a spot. If you have a multi-story house, you should consider using a high-pressure spray kit. Most pressure washers only spray soap under low pressure. These new lances spray detergent up to 25 feet under high pressure. If your home hasn't been cleaned in a while, use a rotating or utility brush to help loosen thick layers of dirt. 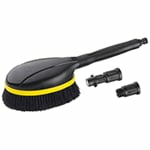 The brush simply snaps to the end of the pressure washer wand. Best of all, it acts as a foaming brush, emitting a soapy solution as you clean. Now it's time to grab a drink and relax for 5-10 minutes while the solution works to break down the mildew, grime, and stains. If you're washing in the sun, keep an eye on the solution and make sure it doesn't dry on the siding, or else the solution won't work well. Pressure washers are designed to pack a punch, so remember to start at a distance and using a low-pressure spray. If you start too close and too strong, you could damage your siding or spray water into the walls of your home, creating a breeding ground for mold. Hold the wand at least five feet from the surface and gradually move closer if additional cleaning power is needed. Be careful not to spray directly at eaves, vents or light fixtures. High water pressure can knock out loose windowpanes or break them. Also, keep the angle of the wand pointing down so you don't spray up under the laps of horizontal siding. This will prevent the vinyl siding from buckling under pressure. When rinsing, start at the top and work down to ensure the entire area is soap-free. Pressure washers are a blast to use. Best of all, they work extremely fast, so you can spend more time admiring your work than actually doing it. 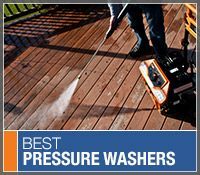 In addition, pressure washers have a ton of uses around the home—from stripping paint, cleaning your deck, scrubbing your sidewalks or even washing the car. Get creative, and have some fun this summer! 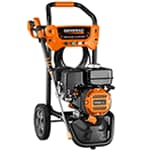 Pressure Washing Vinyl Siding.. Our Power Equipment Direct how-to library can help you learn about Proposition 65 Product Labeling, Sales Tax Information and Product Recalls for Pressure Washer Equipment.